I’ve been thinking a lot these days about the local hardware store that ran Home Depot out of town in Brattleboro, Vermont a few years ago. It couldn’t compete in all of the areas where ‘big” dominates, so it competed in a way “little” dominates — friendly, customer service. It’s the sort of lesson that American business should have learned going into a recession and, obviously, some have. But good customer service remains a vanishing experience. Over the weekend, I received a package I’d ordered from a big chain — auger belts for the snowblower that bears the company’s name. But inside were two engine pulleys, not rubber belts. If you’ve ever ordered anything online, you know that you search for a part number, get a listing with pictures and then click “add to cart.” It’s pretty hard to mess it up, especially if (a) the page doesn’t include engine pulleys and (b) you can spot the difference between an engine pulley and a rubber belt. And yet, when the box was opened, there were the engine pulleys. It wasn’t so much that she was so clearly wrong — I’ve coded a web page or two in my day and I can tell you eight different ways an online ordering system could introduce errors — it was the sweet voice that did little to mask the underlying derision. A sweet voice in customer serviceland acts like the word “alleged” in news stories about crime. It’s not meant to indicate that maybe the guy didn’t do it, it’s meant to keep the lawyers out of the newsroom. But that’s a story for another day. “I can hardly hear you, could you please tell your colleagues to keep it down?” I said. Message received: “Your business doesn’t mean anything near as much to me as me letting you know how much I dislike you and your engine pulley story.” Allegedly. After telling me it would cost $7 to send the package back, she offered to send me the items I actually ordered. “It will be $32. $48 after the shipping charges,” she said. I let it go. It would be pointless to ask why sending a package back to the company (a package of engine pulleys weighs more than a package of rubber belts) would be half the cost of sending a package to me. And, besides, by then I didn’t want to give this company any more business. A consumer today has but one option during times like this. Shop elsewhere and tell Twitter. So I did, and yesterday a person in the company’s executive offices called and offered me a $40 gift certificate for my trouble. So let’s add up the cost here. $40 for the gift certificate plus the $50,000 to $60,000 it probably costs to hire someone to undo the mess that another employee made and refused to fix, plus the amount of all the business I would have given the company before I die, and the cost of all the high-priced advertising intended to get me into your store in the first place … all of that to save $7 in postage. There are thousands of people — job creators, you might say — who can’t figure out why that math doesn’t work. And because of that, they’re trying other ways to eventually keep the customer happy instead of initially keeping the customer happy. Many businesses run new media efforts through PR or marketing. I have even seen a few that run social media through their outside marketing agencies (talk about being close to the customer). Anyway, I have tried a few of these out over the years. My view is that these disconnected businesses are attempting to placate consumers, to minimize or eliminate the complaint. In order for social media service to scale, change MUST happen. Companies must care. New metrics must surface that place the customer back in customer service. I do not get a sense however, that much has changed in the way businesses run, no matter how engaged in social media they are today. This is not because the scaling is not possible, because for the most part you can queue up a tweet just as easily as you queue up a call. The trouble is the efforts are not leading to wholesale change in the way companies interact with their customers. If you are simply placating loud customers, all you are really doing is encouraging others to focus on the channels where they believe resolution awaits. What people failed to see regarding the Dell or Comcast success stories in the early social media days, is the amount of work that went on behind Twitter, Facebook, and blogs. The true transformation of these businesses what not in taking to social network, but instead building the back end to start fixing the problems that created negative experiences in the first place. In my list above, I mention the power of stories, and both Dell and Comcast utilized these online conversations or stories to help drive improvements. I am sure both companies will admit that this is an ongoing process and that wholesale change does take time. Somewhere in Vermont, there’s a very smart hardware store owner who shakes his head when he hears businesspeople described as “job creators.” Maybe he had a nice degree in business. Maybe he’s only a working stiff. But he’s in business today — and a big conglomerate store across town isn’t — because he understands that the real job creator is the person who walks through the front door and needs an auger belt. Big business, er, Job Creation is primarily concerned with Profit For the Shareholders Creation – not creating a better widget, not paying a decent wage, and not pleasing it’s customers. If any of those things lend to higher share prices, smart management will figure out how to incorporate them in order to meet it’s real goal. In some cases we still have the opportunity to take our business elsewhere. I’m currently dealing with my cell phone company (t-mobile) and it’s nickle-dime-$20 fraud. When I called them on it, two customer service reps admitted their error, and both said that the best way to rectify the situation would be to file a fraud complaint through my bank (Wells Fargo – not renowned for it’s business ethics either). I’m going to move to a credit union, but does anybody know of an honest cell phone service provider? While we’re complaining about customer service, can we please have an end to the cheery “Your call is important to us!” messages while waiting on hold for customer service? If my call was truly important to you, there would be enough people on staff to answer the phone promptly. Create some jobs, you job creators! I don’t have a cell phone, so that’s all I know! I’ve got a little hardware store by my house that kills it when it comes to customer service. Amazing service both in English and Spanish. Prices are terrible, but convenience and awesome service keep me going back. Only problem is that if you can’t browse for more than a minute without someone asking you if you need help. Unlike Home Depot, the place is crawling with employees. Why the shot at “job creators”? Any chances something like this could happen at a socially responsible govt agency (Wisconsin DMV comes to mind), a college or a hospital? Could a breakdown like this even happen in public radio station? It is a bureaucracy issue far more than the profit motive that creates these snafus. I suspect that had you reached the CEO of the snowblower company he would have made the simple economic decision to fix the problem correctly. He can’t solve all the problems so he delegates. The smaller the problem the lower the pay grade of the person solving them, the greater the chance of error…but they are more likely to be low value errors. You got caught by a low level, low paid person that is likely to remain low paid for years to come based on your call. Not a bad company just a dullard working in a call center. // Why the shot at “job creators”? I wonder to what degree these situations would disappear if more companies put money into customer service–which I think is the basic point here. I can’t help but remember my days managing a local pizza place; upper management kept me understaffed, overworked, and woefully underpaid. So, perhaps not logically, I took out my frustration on any customer so bold as to desire pizza. Ultimately, you’re not going to get good customer service from someone who feels overworked, underappreciated, and monetarily unequal. I wonder if the initial contact would have been more pleasant–and productive–if the woman working customer service was paid twice what she makes now. That’s a great question. When I was first starting in the business, I made $110 for a six day week. no benefits. Not once did I ever think, “I’m not paid that well, so I think I’ll do half-***** journalism today. I think there was an article on here a couple months (?) ago about how those who think they deserve a better job or more recognition tend to be more rude etc. 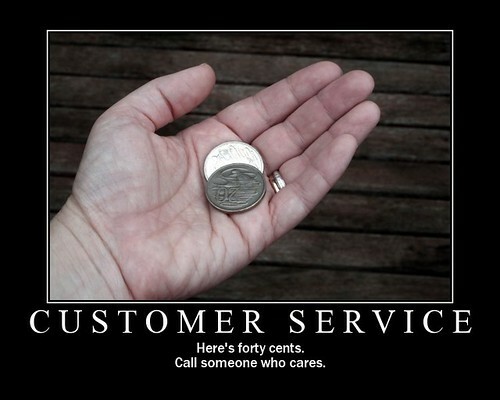 Either way, I have worked at places (ex Boy Scout camps) where customer service is #1. While there are times people may yell at you for nothing you have done to them, a smile and calm voice goes a long way. I usually got apologies after the blow up. In the end, places that show they value your experience (even keeping noise down so you can hear them) will help getting repeat business. I think a lot of companies think they don’t have tough enough competition to care about customer service and it usually is low on the priorities list. This is one of the reason I prefer Target over Wal-Mart (try going into the middle of a Wal-Mart and asking someone where a specific item might be- like velcro strips). I did and I get that using quotes makes it okay to pretend we aren’t using it the way its being used in the national conversation but sometimes it is necessary to call out that the pretending is just a thin veil. As for the assertion that consumers are somehow superior to producers or middlemen it is just as fallacious as the republican position that business should be elevated over people. I have no doubt that the hardware store owner from Vermont understands that as well but being folksy sells more nails. Is there a difference between an employee that thinks they deserve a better job or more recognition and an employee that feels as though he or she is being taken advantage of by an employer? That is, what’s the difference between an “entitlement-generation” employee and a respectably outraged employee? This reminds me of a time that I did some business with Pierce Skate and Ski in Bloomington, MN. They accidentally charged me $30 twice for something. When I discovered it later that day, I called them and politely asked them to fix the problem. The apologized and canceled one of the charges on my credit card. There — problem fixed; I was satisfied. A couple of days later I received a hand-written note from the owner who apologized again for the mistake and included a gift certificate for a free lift ticket at an area hill. Boom – I went from being a satisfied customer to a HAPPY customer, who returned to the store and bought ski boots and a ski jacket (both pretty expensive things; both times I received outstanding customer service while trying to decide what to buy) and has told this same story countless times in order to send more business their way. That’s one place that truly gets it. So what you’re saying is even though all of the infrastructure and all of the philosophy is toward creating a market for a product, the actual market for the product isn’t actually the key point? If you go back and read — or read for the first time, if that’s the case — In Search of Excellence, you’ll find the 20 most successful companies profiled in that book all had the same thing in common. It’s not about being “folksy.” It’s about not being phony. It’s about valuing the end of the stream. It’s about service, providing it and providing it efficiently and, moreover, reaping the benefit of providing it efficiently but increasing the demand for whatever widgets we’re talking about. It’s about the difference being having a “sale” sign in a window, or having a “for sale” sign in the window. Jeff’s comment above shows the depth to which at least one business owner understood. Nobody creates a job for any other reason than to make a sale. That’s what makes the customer the actual job creator. Want to create jobs? Create customers. Using a snow shovel is better for the environment. Oh, that story reminded me of another. There’s a company in Farmington called SteinAir, which was started by two former Northwest people. They build avionics panels primarily for the homebuilt aviation market, which like the rest of the aviation market, has been in a disastrous slump for years. He was a dealer for a company called Direct 2, which provided Chelton avionics to the experimental industry — a BIG bucks product. A few years ago, without notice, Direct-To Avionics ceased operations leaving potentially dozens of kitbuilders without equipment or immediate support for experimental versions of the Chelton system. People had paid tens of thousands of dollars to the company for a product that never appeared. In many cases, Stein Bruch, the owner, was the passthrough of that money. People paid him, he paid Direct-To and then he assembled the instrument panels. There was, of course, legal hoops to jump through to get your five cents back on the dollar. Though he’s a very small company, SteinAir absorbed the losses and provided a suitable product so nobody lost any money, except Stein. However, because of that sort of service, and ethical at that, he does OK now. I was down there a few weeks ago and at every work station there’s an instrument panel being built, each for over $100,000 apiece. His services are more expensive than others perhaps, but few go anywhere else. Maybe he was smart enough to see that in the long-run (there’s a term you don’t hear much anymore) he would MAKE money. Or maybe he just had an ethical streak about him. But in either case, he focused on the customers first and he’s been rewarded for it. His business is booming when others are failing all around him. Like I said, there are smart people with nicely framed degrees on the wall that will proclaim “it’s not really about the customer, it’s can’t be.” But as Tom Peters discovered in the ’80s, it can be, it should be, and it must be for long-term survival. You are confusing salesmanship with an economic transaction. I have a dollar, you have a loaf of bread. I value the loaf of bread more than I do the dollar, you the opposite. We are both equals, we both benefit in the transaction. You may compete with another person with a loaf of bread for my dollar and that is salesmanship – that is what makes you better in my eyes than your competitor. You can do that by being folksy, giving me a bigger loaf, having all natural raisin juice or being closer to me – that is between you and Wonder to battle. My competition is between which discomfort or desire I attend to. Go back and reread or read Human Action and you will find the basics of what causes an economic transaction. No, actually, I understand it just fine. There is a level of humanity in your economic transaction. Salesmanship? Maybe. But it’s not distinct from the transaction, it IS the transaction. You have a loaf of bread. I have a dollar. You hold the bread over your head and say “jump, jump!” But I don’t want to jump and, besides, there’s a guy over here that’s holding out basically the same bread. Why? Because he wants the dollar. You? I don’t know what you want but it’s not the dollar. Chances are you’ll say, “geez, there’s something wrong with a system in which I can’t hold my bread above my head and make people jump for it.” You know, as if it’s all about you, and not, well, me. And you may be right. But I’ve got my bread, your competition has my dollar, and you’ve still got your bread and a good book to read which might reveal to you the mystery of why you can be such a lousy salesman and still think you know more than I do about how to get my dollar. Just last night I entered the health care version of a customer service nightmare. A family member got a prescription for Drug A. The pharmacy tried to fill the prescription with the recognized generic, Drug B. However there is a system wide shortage of Drug B, so our pharmacy contacted our heath care provider for permission to use Drug A. The health care provider said “No, use Drug C”. Since Drug C is a substitute drug, not a true generic, the pharmacy contacted the physician. The physician said “No, Drug C is counter-indicated, it will make the condition worse, use Drug A”. Our health care provider again said “No”. So I paid $200 out of my, not particularly deep, pockets for Drug A. So in summary, Doctor: “Use drug A”, Pharmacist:”Drug B would work but it’s not available, Use Drug A”, Insurer:”NO”. At what point did health insurance companies acquire the power to determine treatment? And will the customer ever have any leverage over the insurance provider (I’m locked into the insurer my employer chooses … some free market, eh)? I’ve got a similar story about a customer service done right. Sporting goods store “A” in St. Paul once took a pair of boots back after almost a year because they miserably didn’t last up to the warranty. (Sorry no sure if it’s against rules to plug a store, I’ll post who if people ask) No receipt, no question, no problem. I always go back for nearly everything I buy sporting goods related, and always feel that they have been helpful and courteous. Oddly the often have the better price too. Big box equivalents just can’t make up for that experience with size or volume. Jim Shapiro–I had the world’s worst customer service episode moving my mom’s Qwest phone service from one Minnesota town to another. After a week of long daily calls to Qwest, I finally succeeded in getting the new service installed. The bill came with $150 worth of botched charges. I wrote a letter to Qwest and copied the Public Utilities Commisson. A Qwest CS rep, with the power to issue credits, CALLED ME and made the credits happen. The PUC was the reason. Call center employees are typically given a pathway that they have to follow. They aren’t given the freedom to solve problems as best they see fit. Someone, somewhere, decided that they aren’t to be trusted to make a sensible decision on their own. I too love my local hardware store. Crawling with employees who all-each and every one of them-says hi and asks if I need help. Just today I had a case of wonderful customer service with AAA. I called to make some changes on my policy, and the csr went out of her way to find me more discounts to apply to my policy. When does ANYONE ever deliberately try to save the customer money, instead of making the company more money? I was shocks and so pleased! I didn’t even have to ASK for her to look for discounts. She did it unasked. I think some companies need to take a lesson from AAA! Or maybe there ISN’T a level of humanity in our economic transactions anymore. Particularly online transactions with big box retailers. And we all know return policies have tightened up. Where’s the trust? There is a trend to simplify return shipping. For example, LL Bean includes a prepaid return shipping label with your order BUT deducts $6.50 from your return credit if you use it. It is convenient because you can just drop off the package at a collection site. They don’t charge you the $6.50 if you have an LL Bean credit card. I personally despise marketing affinity programs of all types – credit cards, points, rebates, frequent flyer miles, etc. – but maybe these are intended to serve as a substitute for the humanity in the transaction. Create and nurture a relationship. Maybe you’re just not close enough to your snowblower provider. //Maybe you’re just not close enough to your snowblower provider. I called Home Depot today after receiving a phone call from their ‘Hiring Department”. It rang on my phone as an 866 number and generally speaking I do not answer those calls but for some reason this time I did. What I got was an automated message from Home Depot following up on my request for employment on their website as a Designer (that was the job I have experience in and the job I was looking for.) After answering some automated questions I was connected to a real person, who enthusiastically offered me a position working an early shift in the warehouse. ? When I explained that I am interested in a Design position and that is what I had marked in my application, he responded with “I am not saying you did or didn’t ask for a Design position but you should go back online and review your application.” ? On another occasion I was offered a position in the carpet department in Eagan which wasn’t my choice of stores to work in. This morning I felt adventurous and called Home Depot, one of the local stores that I was interested in designing for. Customer Service explaned to me, after I explained the intention of my phone call that individual stores no longer make the choices first hand of who gets interviewed but CORPORATE HEADQUARTERS IN GEORGIA DOES. Well how bout that Georgia?